*A very special Benefit screening for the American Indian Center Open to the Public. Donations go to the Center. “Free Speech & the Transcendent Journey of Chris Drew, Street Artist” (99 min) 2014, an indie film by Nancy Bechtol. Chris Drew was the Executive Director of The Uptown Multi-Cultural Arts Center (UM-CAC) located for 25 years in the American Indian Center of Chicago. Trailer is on http://www.youtube.com/user/madpalX and is listed on IMDb. 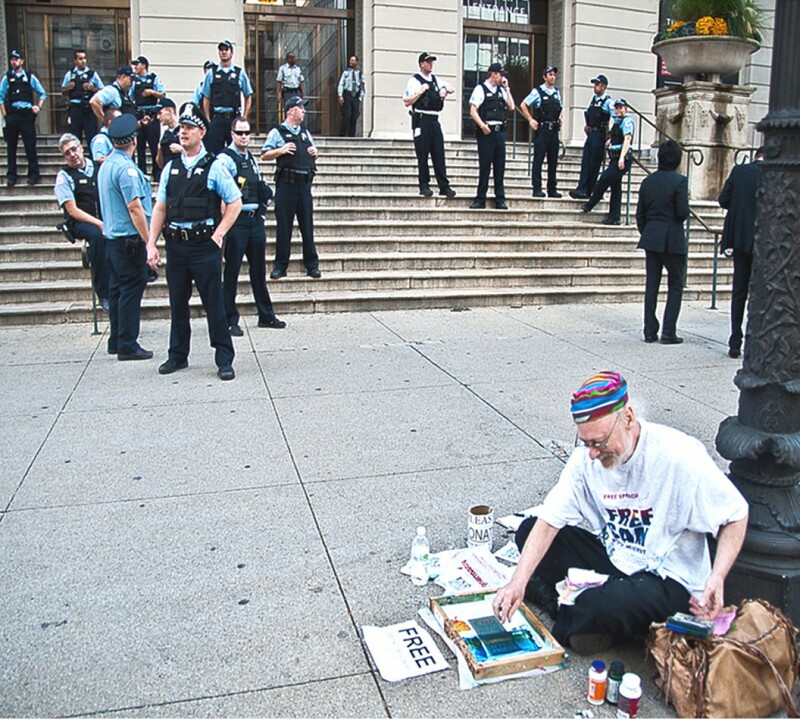 Background: Chris was arrested for selling Art Patches for $1 (in an act of civil disobedience to protest the Peddlers License since “Art is Speech”a 1st Amendment Right) but unexpectantly those charges were dropped and changed to a Class 1 Felony Eavesdropping under the Illinois Eavesdropping Law , one of the strictest in the nation, with 4-15 years in prison if convicted. In 2009 this law was generally unknown. Two pro bono attorneys defended him from 2009-2012. First, Mark Weinberg challenged on the free speech constitutional ground; then Joshua Kutnick, criminal defense, defended and won in the courtroom of Judge Sacks 2012, citing the Illinois Eavesdropping Law Unconstitutional. Contact information: nbechtol@ameritech.net or the American Indian Center. which is appropriate considering that its subject is an artist. when he was charged with felony eavesdropping for recording his arrest. with the efforts of the maverick Drew captured by maverick filmmaker Nancy Bechtol. opening RECEPTION April 17 Fri 7-10 COME BY AND ENJOY MINE AND MANY AT THIS FAB LOCATION FOR ARTS. Reflecting on how the minds of people today in society and life may greatly differ from previous generations. This generation I speak of is Generation D(igital). It spans ages and defines itself on the use and abuse of technology. 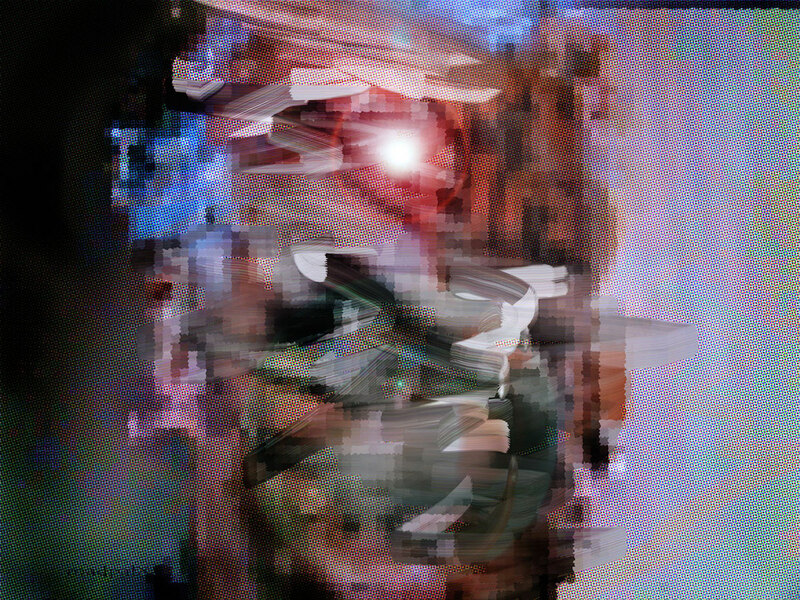 On this, my the first release of the “Digital Mindset” –a series of digital “photo/paintings” I have worked on from 2011 to 2015.